I'm back from a magical vacation in Greece. I loved both the relaxing island of Kea and the bustling Athens. The food was great, the people were welcoming and lovely, and it was a great first time traveling together with my friend Cecilia. I should have stayed longer since I came back to the government shutdown. Sure, it's great to have a day off to recover from the jet lag, edit a zillion photos and maybe even do the laundry. But I'm not getting paid. Luckily, I have savings. Anyways, back to food. While in Greece, I learned how to pick olives and make olive oil, and I hope to share those experiences with you soon. Greek olives were really great. But clearly, Greece is not the only country that produces olives and cooks with them. Last month I made Warm Citrus-Scented Olives with Ricotta Salata recipe from The Glorious Vegetables of Italy by Domenica Marchetti as part of my cookbook dinner club. 2. 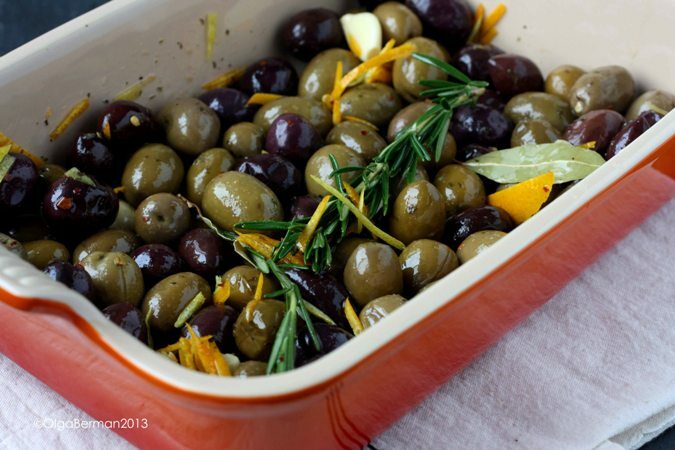 Combine the olives, lemon and orange zest, and garlic in a small ovenproof ceramic baking dish in which they fit snugly in one layer. Drizzle in the oil and wine and toss gently. Tuck in the bay leaf and rosemary sprig. 3. Bake, uncovered, for 10 minutes: toss and bake for another 10 minutes, until the olives are heated through. Remove from the oven and toss gently. 4. 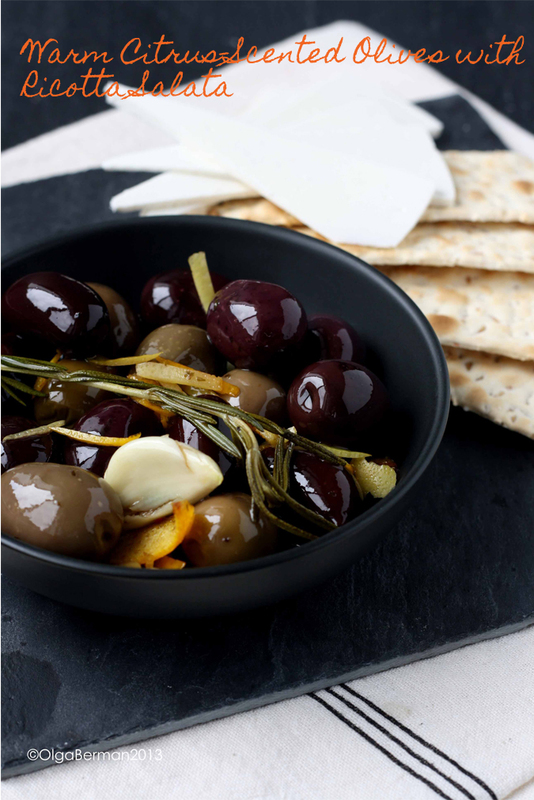 Serve the olives with the ricotta salata and flatbread crackers. This was an incredibly easy recipe to make and a great appetizer. I added a few pinches of red pepper flakes to spice this up a bit. 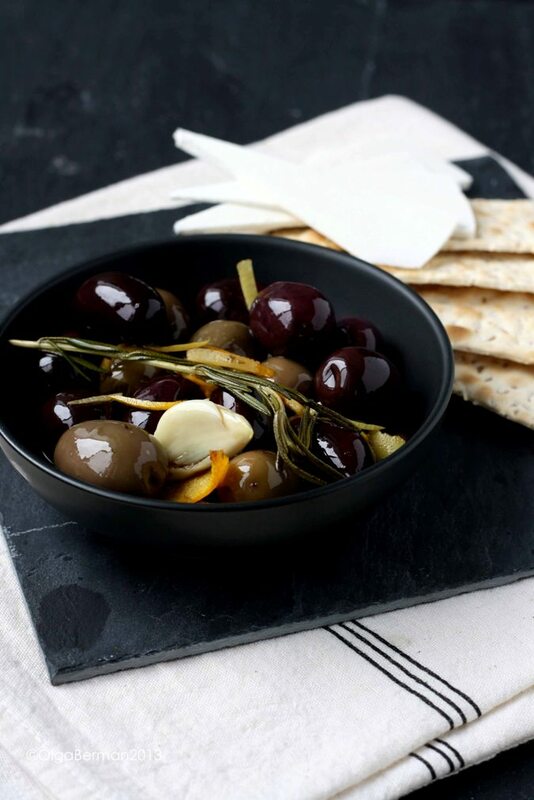 Have you ever roasted the olives before? What did you think? All I can say is....GIMME! Looks delish Olga! How delicious. I've always wanted to try ricotta salata. Does it actually taste like ricotta, or is it totally different? It's sort of like hard feta and a bit less salty. Really good!!! That would be great. Do it Heather! I'm so glad you had such a great trip! The olives look tasty!